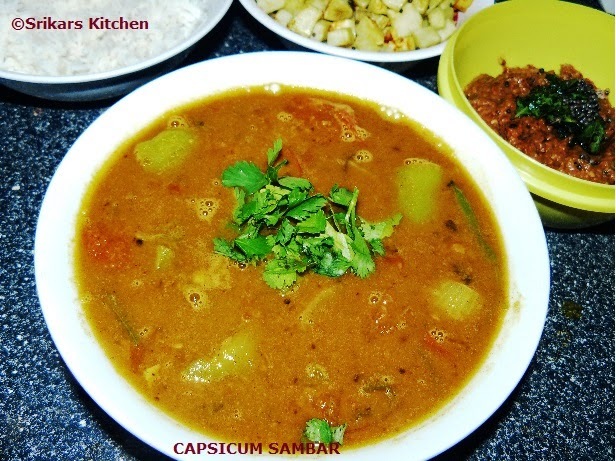 Capsicum sambar is my favorite sambar. It is a normal sambar & but the flavor is really nice.I always used to make this sambar only in green capsicum as i feel green capsicum is more flavorful than other colored capsicum. Heat oil in a pan, add mustard seed, urad dal, channa dal & allow to temper. Soak the tamarind in water & squeeze the juice from it around three cups. & add the tamarind juice to the kadai. Add sambar powder,salt & allow to boil until all vegetables cooked properly. Looks Very different and tasty!